(1) This year’s Kathina Ceremony will be held this Sunday, 30th October 2016. 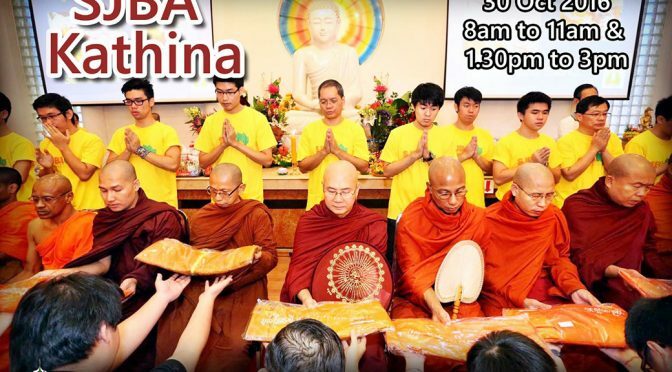 Kathina is, traditionally, a Buddhist Ceremony started by the Buddha Himself for lay devotees to offer robes and other requisites to the Sangha at the end of the 3-month Vassa. The Ceremony will begin on Kathina Eve (29thOctober 2016) with Taking The Three Refuges & Five Precepts administered by the Sangha at 7.30pm followed by Dhamma Talk, Procession, Blessings by the Sangha and Sharing of Merits. This year’s Procession will be very significant with the inclusion of Buddha Relic and ola-leaves Tipitaka in the procession. (2) This year’s Annual Vipassana Meditation Retreat will be held at Sri Lanka Buddhist Temple, Sentul from 29th December 2016 to 7th January 2017. The Retreat will be conducted by Sayadaw U Pyinnyarnanda from Chanmyay Yeiktha Meditation Centre, assisted by our Abbot, Ven. Nyanaramsi. If you wish to join in the retreat as yogi or wish to a helper or sponsor food for the monks and yogis, and other expenses during the Retreat, please contact our Office Administrator. (1) The Intermediate Course on Buddhism will be ending on 28 October 2016. The course run for 6 consecutive Fridays from 8.30pm to 10.00pm, conducted by Uncle Vijaya, Bro Charlie Chia and Dr Chan Kah Yein. The course cover Buddhist views on contemporary issues and Buddhist living. All are welcome. Please contact Sis Cindy at 03-56348181 for further details. (3) This year’s Annual Vipassana Meditation Retreat will be held at Sri Lanka Buddhist Temple, Sentul from 29th December 2016 to 7th January 2017. The Retreat will be conducted by Sayadaw U Pyinnyarnanda from Chanmyay Yeiktha Meditation Centre, assisted by our Abbot, Ven. Nyanaramsi. If you wish to join in the retreat as yogi or wish to a helper or sponsor food for the monks and yogis, and other expenses during the Retreat, please contact our Office Administrator. (3) This year’s Annual Vipassana Meditation Retreat will be held at SJBA from 29th December 2016 to 7th January 2017. The Retreat will be conducted by Venerable Sayadaw U Sobhita and Sayadaw U Pyinnyarnanda from Chanmyay Yeiktha Meditation Centre, assisted by our Abbot, Ven. Nyanaramsi. If you wish to join in the retreat as yogi or wish to a helper or sponsor food for the monks and yogis, and other expenses during the Retreat, please contact our Office Administrator. (3) This Sunday Puja (9/10/16, 10am) will be led by Ven. Indarathana followed by a short meditation and Dhamma Talk. Venerable Indarathana was ordained as a novice monk at age 11 in Sri Lanka. After 10 years of monastic education and training at Sri Medankara Bhikku training Center, he received higher ordination as a fully ordained monk in 2007. He holds a Master degree in Buddhism at Kelaniya University and Bachelor degree of Law at University of Colombo. He is currently pursuing his masters of counseling at HELP University, Kuala Lumpur. He has been living in Malaysia since 2012 under the guidance of Chief Reverend Saranankara Maha Thera at Sentul Sri Lanka Buddhist temple. As a Buddhist monk, he taught meditation and mindfulness practices and give counselling to people from different walks of life using the Buddha’s teachings.